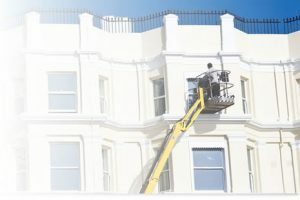 As with window cleaning George Benson Ltd can restore, repair or clean most types of façade. Cleaning is normally combined with periodic window cleaning but can be stand alone. Otherwise known as a ‘non-load bearing vertical building enclosure’, it is an external, weatherproof attachment to a building. It is usually attached to the building’s frame but is not structural. Each form of façade has different advantages and depending on the architectural designs, some are profiled metal sheets, others cladding panels or glass/aluminium curtain walling.